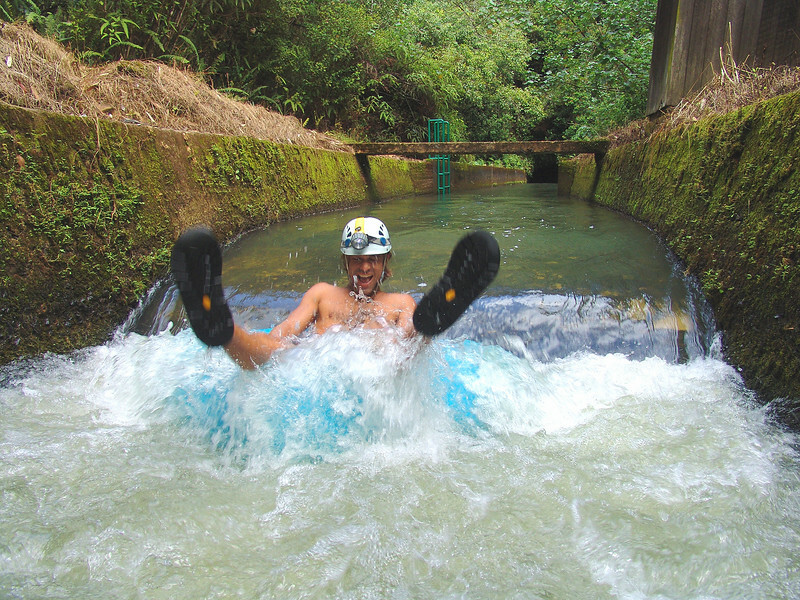 For a Kauai adventure that sends baby boomer travelers laughing and squealing through sugar plantation history, try tubing down one of the old irrigation canals. Kauai Backcountry Adventures offers exclusive access to 17,000 acre Lihue Plantation, a former sugar cane kingdom. The company provides transportation, guides and equipment including a hard hat with headlamp plus gloves. Guests wear bathing suits, water shoes and courage. Hanama‘ulu, tubers board a Pinzgauer, a sturdy 4-wheel-drive transport vehicle, for the picturesque drive to the ditch. As the vehicle bounces along, a guide shares plantation history. The tour makes a photo stop at an overlook for a view of Wai’ale’ale Crater. In the distance, waterfalls decorate Mt. Wai’ale’ale, their thin white ribbons streaking down a canvas of green trees, plants and vines. When the tubing starts, the briskly moving water propels riders down the ditch at 2 miles-per-hour. Tubes spin and twirl bouncing off fern-covered rock walls and into each other eliciting laughs and squeals from the tubers. The journey continues through a series of tunnels (the reason for the headlamp). At the end of the ride, guests board the Pinzgauer again for the drive to a picnic spot complete with swimming hole and waterfall. A lunch of deli sandwiches, potato chips, soft drinks and cookies is included in the excursion price. Kauai offers plenty of adventure choices. Baby boomers can choose from hikes, zip-line fun and sailing excursions. But I bet you laugh the most on a tubing adventure. We did. What’s your favorite Kauai adventure? Join the conversation at the My Itchy Travel Feet page on Facebook or send us an email.